Halloween is just around the corner: Prime time for an outbreak. Are you ready? Here's what you'll need to assemble your apocalyptic go-bag. 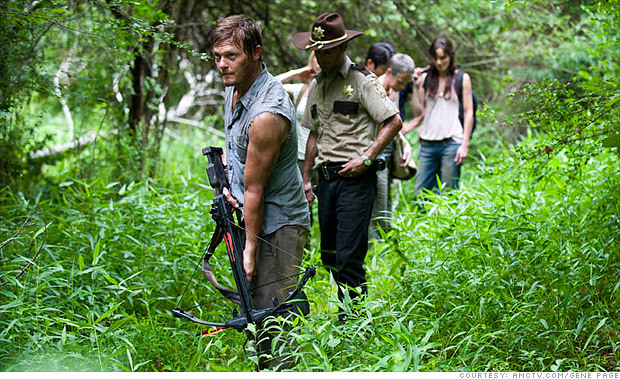 Zombie slayer Daryl Dixon walks point with his crossbow, an essential survival tool, in the AMC series "The Walking Dead." The Centers for Disease Control has actually gone to the trouble of posting its own guide to battling the undead. So shouldn't you take at least a few precautions? The government's tongue-in-cheek communique includes a go-bag of practical products for surviving a zombie apocalypse, such as a utility knife, duct tape, a battery-powered radio and a first aid kit. There are also plenty of wish lists on Amazon.com to guide you. It's hard to tell whether these shoppers are serious or just getting ready for Halloween and next week's return of the AMC series "The Walking Dead." But if you want to be safe instead of sorry, here's what you need to avoid becoming lunch of the living dead. Ever dream of having your own reception hall? Thanks to the housing bust you can get a huge home - cheap.